Offices and classrooms are often set up in an open format that allows everyone to see and hear everything that is happening. That’s not always a bad thing, but, certain activities are better done in a semi-private setting. From testing students to training employees and dealing with clients, there are many reasons to consider temporary walls for cubicles. Here are five reasons to consider installing cubicle panel mount extenders for your students or employees. Individual Spaces – Although there are many times when group-work and collaboration are beneficial, that isn’t always the case. Special projects in the office or testing in schools require a quiet, individual space to work. By using cubicle panel mount extenders, small, semi-private offices can be created in just a couple of minutes. Sound Absorption – Telephones ringing, conversations being had and typing can all be extremely distracting, especially when combined. It may not always be possible for employees or students to use headphones or other means to block out the noise. Cubicle panel mount extenders with sound-deadening fabrics all but eliminate ambient noises and help create quiet areas for study and employees to work. Ease Of Installation – It literally takes less than five minutes to install cubicle panel mounts and it only requires a small allen wrench to get the job done. That means you won’t have to call in a carpenter to make sure the installation is done correctly. It also means that there are no lengthy disruptions during classes or working hours. Easily Changed – Perhaps your students or staff only need the added privacy for a short time. These types of panels are just as easy to remove as they are to install. This is excellent news should you decide to change the overall look of the space as well. Additionally, there are several fabric and polycarbonate options that will suit your needs. Cost-Effective – While it may be tempting to order new furniture that will accommodate your needs, it’s not always possible. For most businesses and schools, finding room in the budget to upgrade the furniture is impossible. 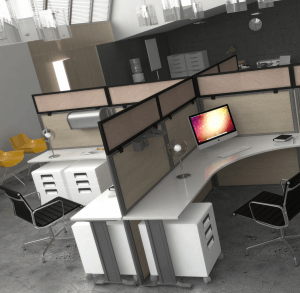 Rather than purchasing all new cubicles, simply adding to your existing furniture is a much more cost-effective and eco-friendly choice. If you are interested in learning more about cubicle mount panel extenders for your school or office, contact us. We will be more than happy to talk to you about the various ways that you can incorporate them into your space.